Tea Party activist is now “executive editor” at the Colorado Statesman? During The 2013 Government Shutdown, Four CO Lawmakers Said They’d Donate Their Salaries. Gardner Has Yet To Prove He Did So. Kerns: We can’t forget that we have a big senate race coming up here in 2016, the race against Sen. Michael Bennet, one of the more liberal members of the U.S. Senate, very similar to Mark Udall, except, in my view, there’s one big problem with Senator Bennet, and that is, whereas Mark Udall was concerned about one thing and one thing primarily, your uterus–That was his nickname at least on the campaign trail, given to him by The Denver Post.–Sen. Michael Bennet has many, many interests that he wants to control in your life. And to talk about that a little bit is the executive director of Advancing Colorado, Jonathan Lockwood. … I want to go through some of the attacks you’ve made on Sen. Michael Bennet and rightfully so, given his track record. Let’s start with his support of President Obama’s nuclear deal that gives Iran basically unfettered access to nuclear material… Great work you’re doing, Jonathan Lockwood…. 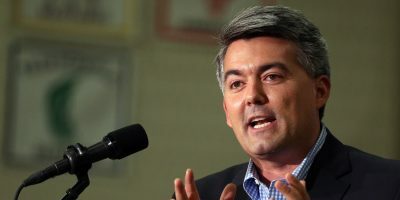 “[Bennet’s] initial support of transferring prisoners from Guantanamo Bay detention camps was an unpopular sell to many Colorado voters,” Kerns reported. Bennet never supported transferring GITMO prisoners here, and Kerns was immediately challenged on Twitter by “MissingPundit,” who pointed out that Politifact found it untrue that Bennet supported bringing Gitmo detainees to Colorado. In response, Kerns called Politifact a “lefty site,” again repeating a conservative talking point that ignores the fact that Politifact won the Pulitzer Prize in 2009. Kerns tweeted that Politifact is “lefty” in the same way America Rising is “righty.” In reality, America Rising was established to expose the “truth about Democrats”, while the mission of Politifact is fact checking. In any case, to the Statesman’s credit, the falsehood about Bennet was later removed from the digital version of the article, but, unfortunately, there was no indication that a correction was made. Asked to discuss this error and her conservative activism, Kerns, who’s also a favorite of KNUS’ Peter Boyles, referred me to Statesman publisher Jared Wright. Wright said it’s “no excuse,” but his small newspaper has been hit with an overlapping staff crisis and vacations recently. A written correction should have been made on Kerns’ Bennet article, in line with the newspaper’s policy, and he promised to look into it. The short staffing, he said, was partly the reason Kerns was writing the Bennet article in the first place, said Wright. The executive editor job is “more of an executive officer or an assistant to the editorial department,” he said. But Kerns will “pinch hit” as a reporter, as she did when writing the “Hot Sheet” feature when Wright, who usually writes the informative daily political briefing, was away recently. Wright believes that advocates can make good journalists at a political newspaper like the Statesman, due to their insider contacts and deep political knowledge. But, I told Wright, Kerns looks like a conservative operative at work at the Statesman, which, two sources say, is under the majority control of conservative power-broker Larry Mizel. Wright said expects Kerns’ outside political work to end soon, though she’ll still have her opinions, and some of it was on tap before she started. “I’m fully aware that Jennifer has her bent, probably more than anyone else on our staff,” said Wright, who’s a former GOP state lawmaker, now a registered independent. Who’s the balance for Kerns, who started last month? Kerns has a track record as an operative; Tomasic is a journalist, I told Wright. The question is, given what we’ve seen so far, can the team control Kerns? Clarification: An early version of this post implied that the Statesman is begging for progressive job applicants. This is not what I meant. Also, the incorrect statement that Tomasic wrote for progressive causes was removed.